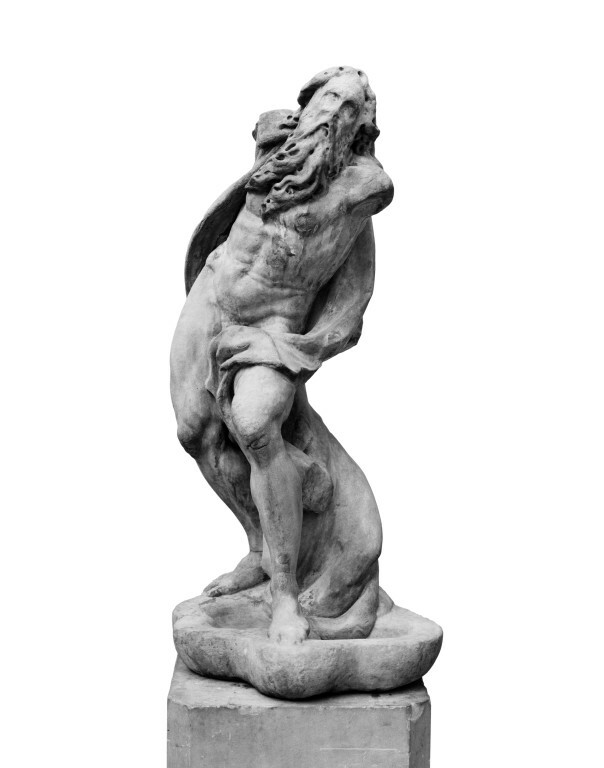 This statue representing Neptune is attributed to Claude David, made in England in ca. 1702. It was previously known as 'Time'. The statue came to the museum from the garden of Alford house. This house was built in 1851 by M D Wyatt for Lady Marion Alford, sister-in-law of Earl Granville, Vice-President of the 1851 Commission, who was closely involved in the formation of the Museum. The house occupied the north-east corner of Wise's nurseries which was later renamed Ennismore Gardens. In August 1955, the building was declared to be demolished. The statue however appears to have come to the Museum prior to this date. The presence of the statue at the Museum is confirmed for the 1870ies through two photographs at the Museum on which the statue appears. The statue might have formerly been part of St. James Park together with another statue. The gardens were later redesigned by Henry Wise, and this may have resulted in the statues being moved to Wise's nurseries at Brompton Road. Marble statue of Neptune. Neptune is represented as an elderly man with long flowing hair and beard. 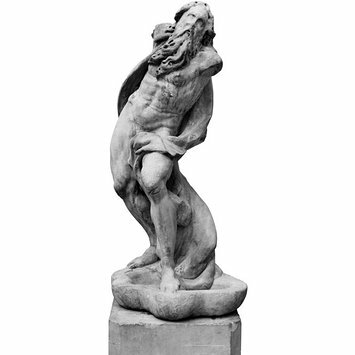 The muscular figure rests his weight on his slightly bent right leg with the left leg extended, bent before him. The axis of the body is in a serpentine line starting from the head and shoulders, which are curved to the right while the torso and hips swing to the left. The figure is draped with heavy swirling drapery which swoops up behind from the base, passes up over the right shoulder, and then swirls forward around from the back and over his left thigh, ending behind the knee. The marble appears to have been broken here and probably extended further. The statue came to the museum from the garden of Alford house. This house was built in 1851 by M D Wyatt for Lady Marion Alford, sister-in-law of Earl Granville, Vice-President of the 1851 Commission, who was closely involved in the formation of the Museum. The house occupied the north-east corner of Wise's nurseries which was later renamed Ennismore Gardens. In August 1955, the building was declared to be demolished and rebuilt on the site of Alford House. The statue however appears to have come to the Museum prior to this date. The presence of the statue at the Museum is confirmed for the 1870ies through 2 photographs at the Museum on which the statue appears. The statue might have formerly been part of St. James Park together with another statue. The gardens were later redesigned by Henry Wise, and this may have resulted in the statues being moved to Wise's nurseries at Brompton Road.